How are Chiropractic Treatments Made? Sacro Occipital technique or SOT is a system that looks at the body as a whole. If just one problem in isolation is adjusted it will usually not get better until the whole spine is in the correct alignment. SOT approaches this concept by addressing the bones at either end of the spine- the sacrum and the occiput. This is the underlying theme in all of Dr. Cappillo’s treatments. 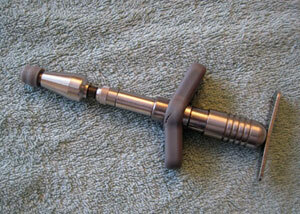 The Activator is a mechanical spring loaded instrument. It delivers a quick gentle impulse into the joint or muscle that Dr. Cappillo deems necessary. The speed with which the Activator is able to deliver the adjustment is the most important factor in creating a change within the nervous system and the joint alignment. Nerve endings in a joint that is out of alignment are not relaying the proper information to the brain. It is the wrong information because the joint is not working properly. The Activator, when used properly, can change the joint position and affect the nerve endings in that joint to correct the misinformation in the nervous system. Using the correct angle and pressure, the joint alignment can then be restored. Muscle testing picks up on the misinformation in the nervous system and will reveal a weak muscle test. This shows Dr. Cappillo where and how to make adjustments with the Activator. A strong muscle test after the adjustment confirms the correction has been made effectively. In addition, the strong muscle test also “locks” the correction into the neuromuscular system which helps treatments hold longer. All of these techniques in combination deliver the most complete yet gentle adjustment for the patient. This allows the patient to get better faster with the least amount of discomfort.